Weather, as always, is the determining factor in having a good spring season. The weather for us in early March was cold and sales were not there. Despite the cold weather, we managed to have a moderately successful spring. While we did not have a great spring, we have had worse, but its been a while. We also experienced a severe hail storm that damaged ALL of our greenhouse film resulting in an unexpected expenditure to replace the damaged film. Money that could have been better used elsewhere. Cora Vinca was the surprise breakout plant of the spring. We had a lot of traffic on my Cora Vinca blog posts (here and here) plus there has been a lot of press about how tough and disease resistant the plants are which seems to have caught the consumer’s attention. Reports from the garden centers about how spring went were mixed. Some had a great spring while other were flat and still others were down. Over all the reports probably averaged a flat rating with the good and bad reports canceling each other out. As you may have heard there is some consolidation happening on the grower side of the industry. One major chain cut its live plant suppliers from around 500 vendors servicing the whole country to about 100 vendors. Since then some of the former suppliers have gone out of business, others are reorganizing, decreasing production and shifting their focus to servicing garden centers, and some have become contract growers for the remaining vendors. We will talk more about this when we look ahead to 2009. Fall mum season was down for us and from what we hear for the garden centers as well. Pansy sales on the other hand were outstanding for us. Reports on pansy sales from the garden centers were mixed again with geography playing the main role in the results. Poinsettia sales were again decent for us. We were left with some #6 red that we did not sell, but sold out of the #8 and #10 sizes early. A few shops cut their orders at the end due to poor sales. I have not heard much about how well the poinsettias sold in the stores yet. I assume most of them are like me and are glad that the poinsettia season is over with and don’t want to think about them any more. Weather will again be the determining factor for success. All any of us can do it plan, plant and hope for the best. I expect a cooler and wetter spring which also should translate into a longer spring. I hope I’m wrong and spring is wonderful. New spring items – we have added about 70 new items this spring (including multiple sizes) and have adjusted production to match what we think we can sell. After we did make the production adjustments we took a step back and looked at the bottom line and realized that we actually increased production. Good or bad, we should have plenty of product available this spring. New items that I think will be a hit this spring – Zahara Yellow Zinnia, Tiger Eye Rudbeckia, Indian Summer Coleus and Henna Coleus. And if we can get the seed Purple Flash Ornamental Pepper and Toucan Purslane. I will be talking about all of these in the coming weeks. Cora Vinca will be big next spring so be sure to order plenty. Garden Centers – if a garden center had a hard time being profitable in 2008 then I predict that without significant changes to their business model they will be close to being out of business by the end of 2009. 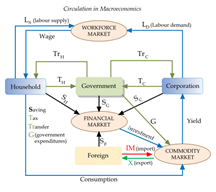 The reason being that if they had trouble paying their bills or getting credit in 2008 then it will be next to impossible to buy on credit or get a loan in 2009. Banks and supplier will not want to risk extending credit to shaky customers. My advice is to stay in good with your suppliers and pay your bills. Consolidation – there will be quite a few growers out there with excess capacity to fill. The one question everyone is asking is what are they doing with that capacity. If the majority of them planted the excess capacity in hopes of selling then it means that there will again be more product than demand, forcing suppliers to compete on price for product of questionable quality. If the majority cut production or closed up then it should mean decent availability at fair prices. Either way there will probably be a grower somewhere that will cut his price to get some business. All I ask is that you remember your primary supplier who has worked with you for years providing top quality before you buy from a cut rate grower with unproven quality. In the fall, I think we will see some cut backs in production especially with the lower margin items like mums and kale from growers and garden centers anticipating a slow fall season. However, I believe pansies will still be strong. Overall, pansies are the best value item for consumers that anyone grows. Can you think of another item of comparable price that people buy and plant that they can enjoy blooming for 6-7 months? Poinsettias will be down next season. Again I don’t see many growers or garden centers bringing in a lot of low margin plants that they may or may not sell. This will be especially true of the #6 commodity size. Demand for the larger sizes will be strong, but the production may not be there to meet the demand since production has to be finalized by early June. I think 2009 can be a great year just like any year has the potential to be a great year. To be successful in 2009 will take hard work, vigilance, agility and a lot of creativity. What do you think? Agree wholeheartedly? Am I off my rocker (more so than usual)? Let me know. I’d love to hear back from you or any one at all for that matter. We here at Parks Bros. wish all of you, our customers and suppliers, a very merry Christmas and happy New Year. We have enjoyed working with all of you and are looking forward to another great year. We hope you all have a safe holiday season. We will be closed December 24-26 and December 31-January 2. We will be open tomorrow (December 23) and next Monday and Tuesday (December 29-30), but I don’t expect a lot of work to get done. For the past two months I have been having a hard time coming up with stuff to blog about. Not that there isn’t a lot of stuff going on that I can talk about. It’s just that I really tired of hearing about it all, not to mention having to blog about it. I could blog about poinsettias and how to take care of them, but at this point, if you don’t know that, you’ve probably already killed it. I could start in on spring, but it will be here before I know it so there’s no need to rush. The Auto Industry bailout — let ’em file bankruptcy. A company cannot operate in the long term with a broken business model. Bailing out the auto industry without changing anything will solve nothing. Any company that expects to be around next year (i.e. be profitable) has to be able to produce a product that people want at a price that is competitive with similar products. Do you think that the 2009/2010 models will be any better than the 2008 models? Not likely. They will still be producing cars and trucks that people do not want to buy. What about the nearly 300,000 auto workers that will be out of work? They should have thought of that when they decided not to take a wage reduction to continue to operate. There is a market for cars in this country, but it will take some serious changes to the Big 3 before they are able to capitalize on it. 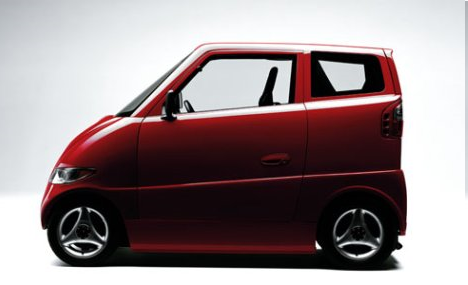 What I would like to see is new smaller niche auto makers enter the market. Once that happens we will see some significant innovations in over all design, fuel mileage, engine performance and alternative energy options. The Movies – due to having a movie buff work for me a few years ago, I have taken to watching the entertainment industry news. Now, I’m not talking about celebrity gossip, but instead, what movies are being "green lit" and what movies are in production and so on. All the experts are saying that 2008 was a terrible year for movies. I couldn’t tell you much myself. The only two movies I saw were Indiana Jones and Iron Man. Indiana Jones was awfully disappointing, but Iron Man was pretty good. I still haven’t seen Dark Knight, but it comes out on PPV on the 26th. The past few years of movies have been disappointing in my opinion. Of all the movies that have come out, there are only about 2 or 3 a year that are worth paying the money to go see. I am looking forward to a few movies next year like Wolverine, Star Trek and the next Harry Potter. You can check out what’s coming out next year at Rotten Tomatoes and yes I like sci-fi but I absolutely draw the line at the Klingon outfit. 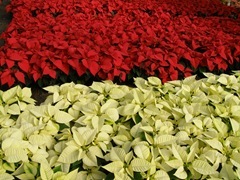 The Poinsettia Season – from what we are hearing from the garden centers poinsettia sales are flat. Some are up while others are down. One customer cut over 1000 pots from their order. 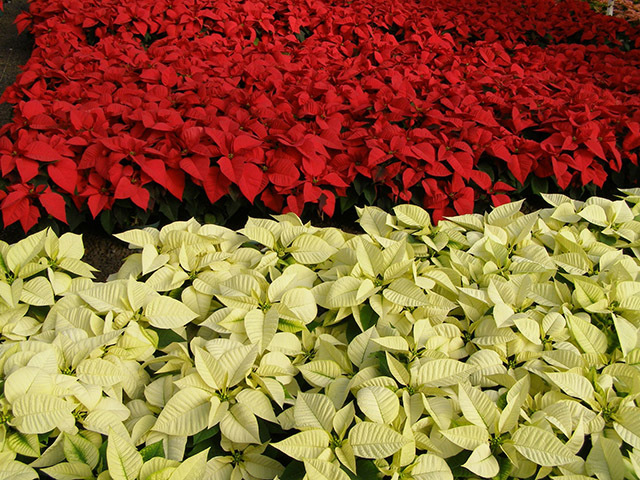 Overall for us, out poinsettia sales were up about 20% over last year, but we did not sell all that we grew. We did sell out of the larger sizes and of the the none-red colors in out #6, but we did not sell all of the #6 Red and Maroon that we grew. We also got stuck with a few of the small #4.5’s after some customers cut their orders. So what to do about next year? Right now we plan on cutting back production to a 100% sell-through level. I guess we’ll see how that shakes out over the next few months. We will have to book the cuttings in April. Also here is a link to Today’s Garden Center State of the Industry article. No poinsettia picture this time. I’m tired of looking at them. Mums – speaking of booking cuttings, our EOD deadline for mums is the end of this month. Anyone have a crystal ball they can loan me? 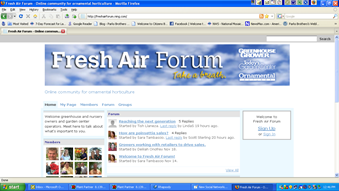 Fresh Air Forum is a social networking site for anyone involved in the ornamental horticulture industry. You can read the discussions with out joining, but you have to join the site if you want to participate. The site function is similar to Facebook in that you join the network and are able to "friend" other people within the network. You can also leave comments on your "wall" which is your personal page that acts like a mini-blog where you can update your profile and add text, pictures and video, and you can also leave messages for other members on the "walls" on their pages. All in all the format is user friendly and easy to use. One problem I did have was up loading a picture. I recommend joining first then uploading a picture. It seems to work better that way. I look forward to seeing you all on the forum soon! The general consensus is that the white, milky sap of the poinsettias can cause some gastrointestinal discomfort, but overall poinsettias are not poisonous to pets. Also, in case you are wondering, poinsettias are not harmful to humans, adults or children. So if you are looking to pull one over on Cousin Eddie this Christmas, you can whip him up a nice salad of romaine lettuce and poinsettia leaves with out fear of actually killing him.